What to look out for when joining a yoga studio, participating in a yoga class, hunting for a new fitness routine, and bettering your life. Right now, all sorts of fitness studios are popping up around Dallas, and I assume the entire country. I am making a mission to visit all kinds of studios but for today's purpose I will focus on yoga. There is a check list I use when trying out a new studio, things I look for, and absolute must haves. I will go into more detail on each of these categories and tell you about one of my favorite local yoga studios, and what makes it so special. 1. Aesthetic Appeal: The minute I walk into a yoga studio, I always expect a look of calm, soft colors, nothing too sharp or bright. I like to see candles, curtains, a very clean and well kept space. Yoga studios often smell very clean, which is best. I like to know that their floor, equipment, and studio is clutter free. Why would you leave your house to go to a space full of clutter and no visual zen? This studio should be your place to get away from the stresses of daily life and relax in a tranquil zone. 2. Size: This category varies based on what you are looking for. If you are all about a HUGE yoga party then you would look for a bigger studio. I, on the other hand, prefer a small, intimate space. It is easier to zone out, focus on yourself, and enjoy the quiet time away from a busy day. Smaller studios may or may not have their own yoga mats. I always encourage buying your own so you know it's clean and you can find one that suits your body. 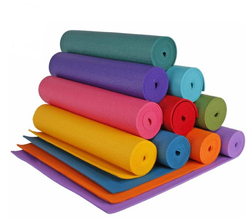 Yoga mats can range in price and material but my motto is always "you get what you pay for." I would recommend spending the extra money for a good mat, this is YOUR only body after all. Here is a great rated mat on Amazon. 3. Range of Classes: As a studio fitness guru, I have been a practicing yogi for about 6 years. I would not call myself a beginner or an expert, somewhere in between. I can balance on one leg, hold a plank, but I certainly cannot do a head stand. For me, yoga is more about challenging my body within a zone of comfort, relaxing, stretching, and resetting my mind. I always look at the schedule of classes in yoga studios to make sure there are classes that range from beginner to advanced. Some classes may have equipment like hand weights, some may be more focused on meditation, and some may include dance moves like Buti Yoga. For yoga classes which involve more movement, you may want to invest in a pair of sticky socks. These are cheap and keep your feet from getting torn up. 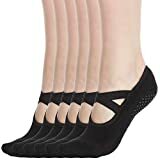 Here is a pair I like on Amazon. Having a diverse set of classes ensures you never get bored and you are constantly challenging your body to try something new. Monday maybe you just do a general basic yoga class, Tuesday could be all about strengthening with hand weights, and Wednesday you dance a little bit. Make sure you get your moneys worth. 4. Instructors: This is a tough one. You never know until after you have tried out a few instructors what it is that you like. This is also more of a personal preference. Some yogis love instructors who are hands on and push you physically to stretch further, hold that pose longer, straighten that leg more. I personally prefer to push myself and not be physically touched unless I look like I am about to hurt myself in a pose. Every so often I am sure instructors cringe at the way a student is holding a pose or hunching their back. In this case, let them help! You want to avoid injury. Try out a handful of instructors, make sure they are spreading a positive message, find some that encourage you to be a better person in and out of the studio. 5. The Extra Mile: The extra mile in a studio is what I refer to as maximum customer service. Check out their bathroom. Do they have a shower? A blow dryer? Spray deodorant? Hair ties? Do they have a water machine or make you pay for water bottles if you forget yours? Does the person behind the desk look like she would much rather be at the mall or does she engage you in friendly conversation? Is parking convenient? Do they have any studio rules? Does your instructor ask you about any injuries you might have? Check out all of these details before deciding to spend your money. Most studios have these things and realize that this is a home away from home for people, they want you to be comfortable here. 6. Community Involvement: Yoga studios should not just be a place that waits for people to come to them. I appreciate studios who reach out, do good in the community, and help educate others on a healthy lifestyle. This aspect is a great way to meet people in your local community. Offer to volunteer at a 5k or a festival to represent the studio, share your yoga journey with others who may not know the benefits of stretching and listening to your body. 7. The Vibe: Last but not least, all of this should wrap up in a nice little mental package I call "the vibe." When you walk in the door do you feel your stress of the day/week/year melt away a little bit? Are you excited to see your instructor? Does she ask you about your day? Do you look forward to going to the yoga studio as much as it's humanly possible to look forward to a work out? You should feel welcomed, at home, relaxed, challenged, passionate, and able to leave all your problems at the door. Nothing is worse than going somewhere to relax, find your zen, center yourself, and not be able to do so. That would be a huge waste of time. I have made numerous friends from studios because I am able to relax and be myself there. My favorite studio in Dallas that wraps up this feeling for me is a studio called V12 Yoga. It is a perfectly sized space, with experienced instructors, they always begin on time, I have made personal friendships, they are a family run small business, and they are very involved in the community. V12 helps local charities, gives back to businesses by providing healthy education, and has a nutrition plan their clients can get access to. So get out there, find some yoga studios, and start finding your zen!